In the late 19th century Lewis Haslam, a Lancashire mill owner and politician, began to link the partnering of holes and warmth and with two medical colleagues, began experimenting with aeration; trapping air within the warp and weft of fabric. The result was a fabric that provided a barrier between the warmth of the skin and the chill of the atmosphere and in 1888 they formed the "Aertex" Company. By 1891 Aertex was firmly established in the wardrobes of the middle classes. 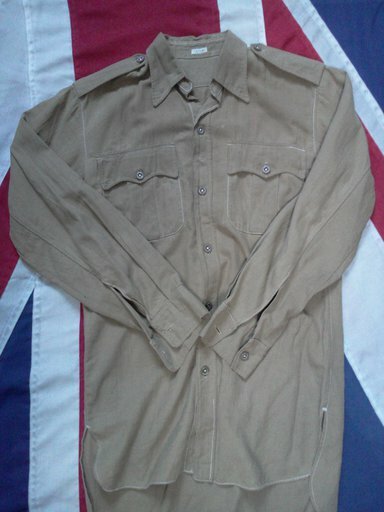 The British Land Army wore Aertex as part of their uniform in World War II, and the British 7th Armoured Division (Desert Rats) wore "sand" coloured Aertex bush shirts and jackets. 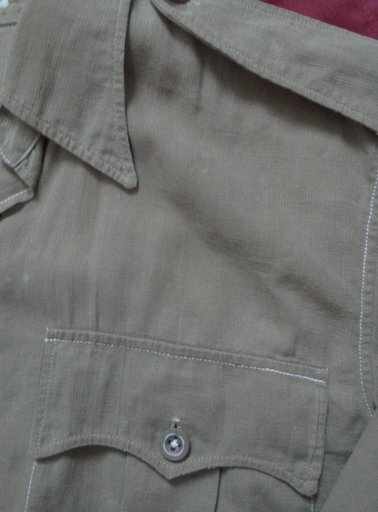 Example of sand/khaki coloured Aertex shirt. 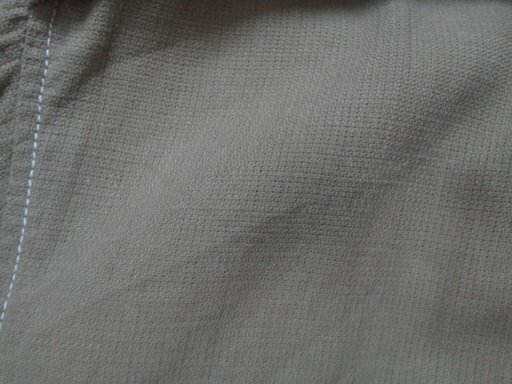 Note: the Aertex weave, trapping air in the warp & weft of the fabric. 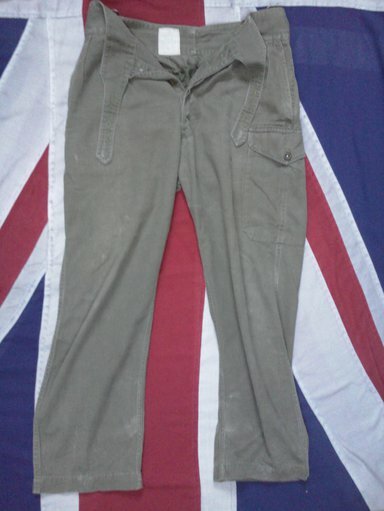 British and Commonwealth garrisons stationed in India and the Far East had been wearing sand coloured cotton Khaki Drill (KD) uniform since the end of the 19th century. 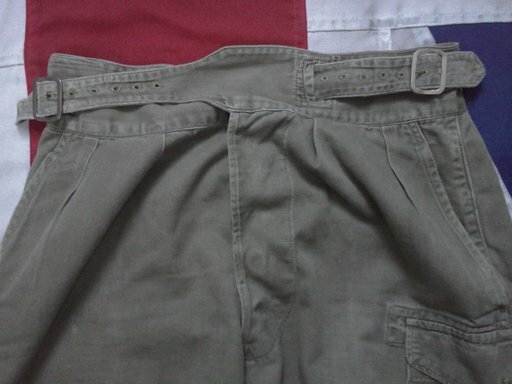 During the 1930's this had been replaced for field wear by matching tropical shirt of softer, better ventilated Aertex fabric, worn with KD shorts, or with "Bombay bloomers" - trousers which could be worn either full length and confined by hose or puttees, or buttoned up to form rather baggy and inelegant shorts. 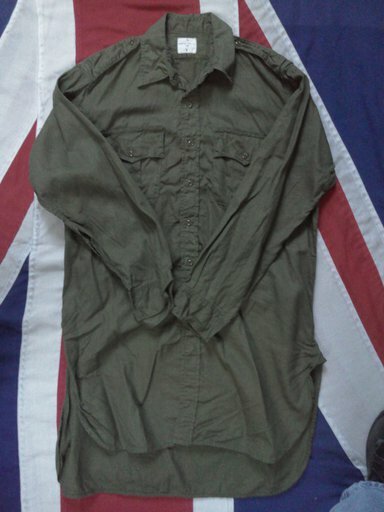 This clothing proved inadequate as jungle uniform in Malaya / Burma. The shorts and Bombay bloomers left the lower legs exposed to thorns and insects, with a consequent risk of infection; and the light colour, while not necessarily conspicuous when immobile in the dappled, high contrast high of the jungle, was highly visible during movement. 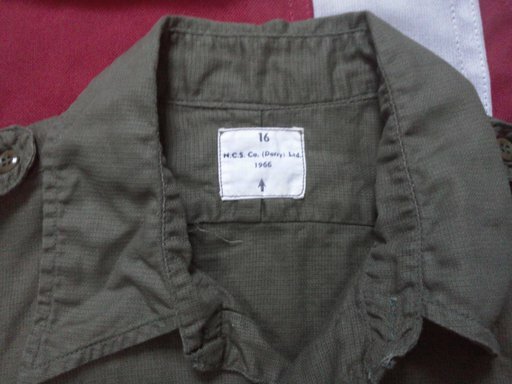 Indian made Dark "Jungle" Green Aertex Shirt. 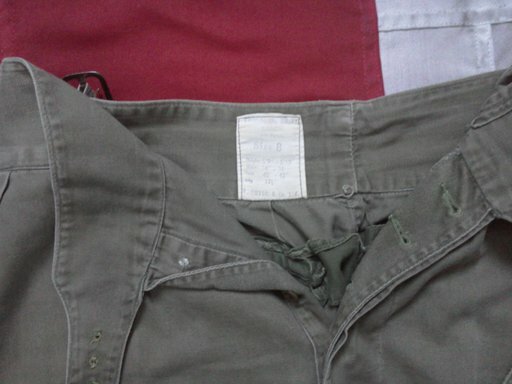 This short coming was overcome in 1942/43 by bulk-dyeing KD items a dark "jungle" green colour. 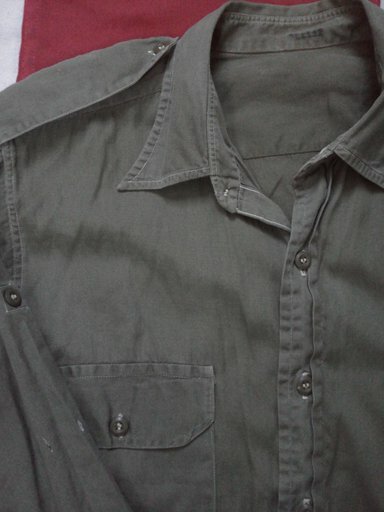 These redyed KD uniforms, together with drab brown Indian made wool angora shirts, soon became the standard jungle clothing, though even as late as 1944 some units were still wearing KD in Burma, and it continued to be used in India. The redyed kit was simply a stop-gap while lessons learned in theatre were put to use in developing jungle clothing. Much effort was expended during 1943 in testing variations of uniforms, equipment and material. 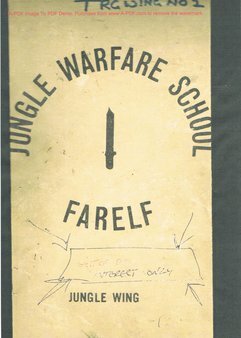 The first dress specific to jungle warfare was the Indian made "jungle green" (JG) version of the British Army's ubiquitous Battledress (BD) uniform. 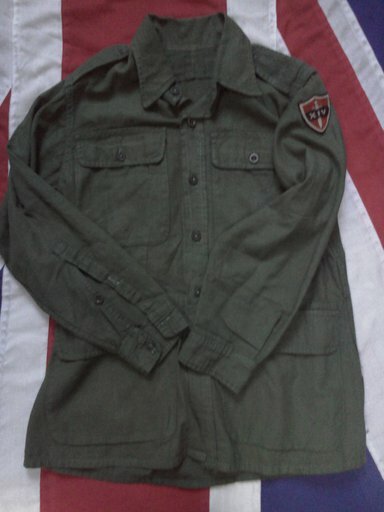 First produced in 1943, in "JG BD" consisted of a cool aertex BD blouse and hard wearing drill trousers; this uniform was also produced in khaki for non-jungle terrain. The new JG BD saw widespread issue in 1944, but the blouse was soon dismissed by the troops as being uncomfortable and impractical; being so light in weight it tended to ride up even more readily than the original wool BD blouse leaving the midriff exposed and caused chafing under equipment. 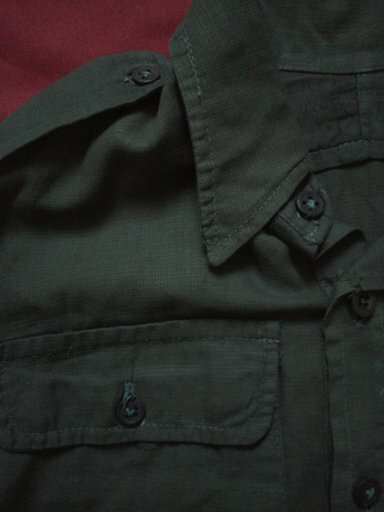 Where possible it was replaced by a longer, four pocket JG Aertex bush shirt, or the comfortable and popular two pocket Indian wool (flannel) shirt. 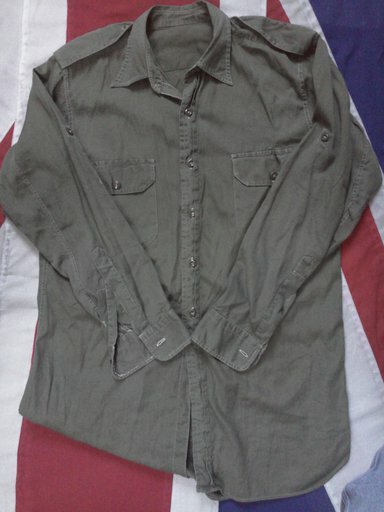 Lightweight ( flannel ) jungle shirt. 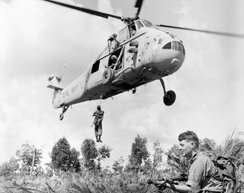 The inadequacies of the JG BD, and much of the other equipment in use in Burma led the British Army to undertake a major research mission into the requirements for the design of a completely new range of unifroms and personal equipment. 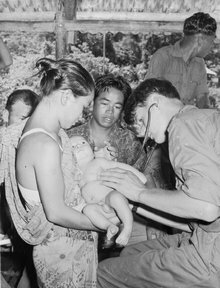 The field research was carried out by 220 Military (Lethbridge) Mission, who spent 6 months in the Far East between October 1943 and March 1944. They consulted the military authorities of India, Australia, New Zealand and USA, as well as seeking the opinions of the troops on the ground, in order to assess the clothing and equipment currently in use and make recommendations on replacment or modification where necessary. This exercise resulted in a recommendation for a complete new range of uniforms and equipment and the discarding of all the items previously in use as unsuited to jungle warfare. Backed up by extensive scientific research in Great Britain, the new "44" pattern clothing and equipment was to be most up-to-date then available to any nation, and at an average saving of weight per soldier of 16 lbs. It included: boots, socks, underwear, pullover, two-piece jungle suit (or tank suit), tropical hat, poncho, Mk IV helmet (with removal liner, the shell being usable as a water bowl), load-carrying equipment and rucksack. In addition the set included a light-weight blanket, personal kit and ancillaries such as petrol lighter, soap dish, shaving / signal mirror, washing kit holdall, lightweight razor, "houswife" (sewing kit), clasp knife, combination knife/fork/spoon set, alloy mess tin, and individual water purifying bag (milbank bag). Other items included sunglasses, a waterproof cover for the AB64 "paybook", "fishnet" mosquito protection, section medical kits and barbar kits - as well as a new rifle and bayonet. The only items that remained in use from the old inventory were the toothbrush, comb, field dressing and lanyard. 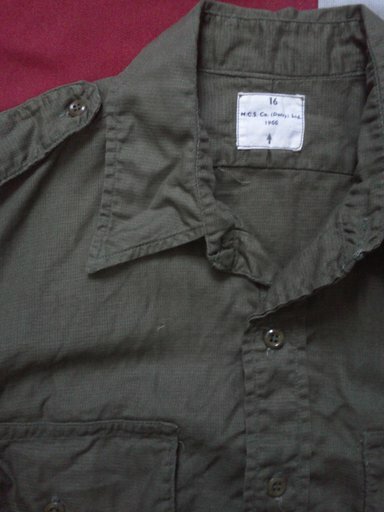 Borneo Era Aertex Jungle Shirt. The new "44" pattern equipment represented a most painstaking study of a British soldier's actual needs, that had ever been carried out before. A new transportation pack was included in the "44" equipment. The Carrier, Manpack, GS was a modified version of the US forces' Packboard, Yukon, based on an item used by prospectors in the 19th century. The idea itself was much older and such packs, with head harnesses, have been well known to eastern peoples for centuries; however, the head harness issued with the GS carrier was much disliked by British troops, who rarely used it. The carrier could be adapted to carry a wide range of equipment from water and ammunition to heavy weapons; it could also take the "44" pattern rucksack, which was attached using three D-rings on the outer edge of the back panel. This method of carrying the rucksack provided better support than the rucksacks' integral shoulder straps, which placed all the weight on the wearer's shoulders. Although no widespread issue of the 1944 equipment was made to troops already in theatre before WW2 ended unexpectedly in August 1945, individual components were provided for evaluation and as replacements, with many troops receiving some of the small items such as the combination KFS set and the signal / shaving mirrors. and as late as 1946 the majority of troops in theatre were still wearing Indain manufactured clothing and equipment. The 1944 web equipment was designed specifically for jungle use; it was light weight, water- and rot-proof, and had light alloy fittings. 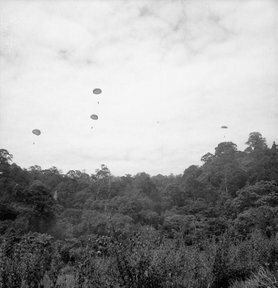 British airborne units engaged in aiding the Dutch in the civil war which followed the Allied re-occupation of Java in late 1945 used the 1944 pattern equipment in combat for the first time. 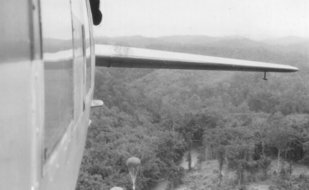 Airborne and parachute formations became the first and only exclusive users of the 1944 pattern equipment in the post-war years, and continued to use it until it was replaced by the 1958 pattern equipment. The "44" pattern, became a theatre issue used for the purpose for which it was designed; campaigning in the Far East. British and Commonwealth troops used the "44" pattern in Korea, Malaya, Kenya and Suez. 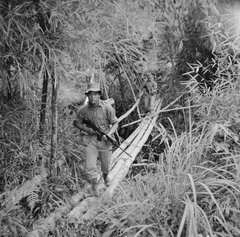 In Malaya where heavy loads had to be carried by the troops in some of the worst conditions of terrain and climate, drastic modifications of the "44" pattern equipment was necessary, with all but the haversack and water bottle being discared in favour of improvised belts, pouches and pack straps. in some cases the "37" pattern pack was preferred to the "44" pattern haversack. (A Bren gunner, would be carrying 85lbsat the outset of an operation. The weight would decrease only slightly as he consumed the food he carried). The "44" pattern equipment was probably at its best when carrying "normal" loads, for which the haversack was well adapted. The water bottle with its useful cup and accesible cover, was probably the best item of the equipment. 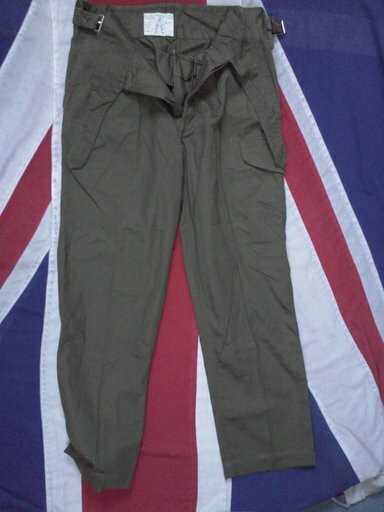 1950 "50" Pattern Jungle Trousers. Note the cross over belt arrangment to provide a wider range of waist adjustment to help compensate weight loss. 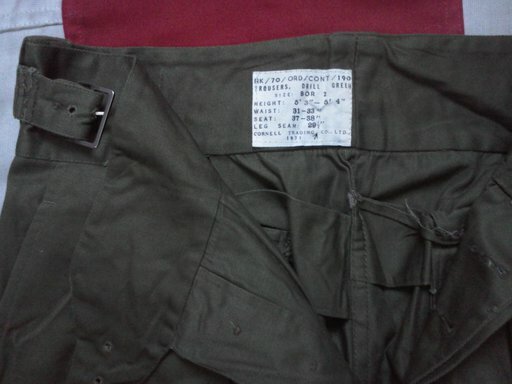 Pair of Hong Kong produced "jungle" trousers, drill green, still being made in 1971. Post war years saw huge amounts of both "37" and "44" pattern web equipment being available to troops. It was not until 1950 the War Office decided to develop a new design of load-carrying equipment. 1951 saw the appearance of the experimental "Z2" pattern from Ordance. This under went extensive evaluation. 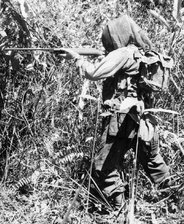 In 1956 troops got the first taste of things to come; padded yoke over the shoulders, with braces or suspenders which attached to the front and rear of the waist belt, a pair of large ammo pouches, a canteen pouch, an entrenching tool attachment and a small bedding / poncho roll fixed to belt; this eventually became the "58" pattern web equipment. In the UK, "58" pattern web equipment was well underway by 1960, for the first time serving troops had a set of personal equipment that had been carefully thought out, was reasonably comfortable to wear, and had provison for most of their needs in battle. This equipment first saw action in the Indonesian Conflict in Borneo. The "58" pattern web equipment served the British Army for some 20 years. Its was not until the Falklands Conflict in 1982 that consideration was given to a re-design, which led to the developmet of PLCE (Personnel Load Carrying Equipment) this emerged in the late 1980's leading to "1990" pattern Infantry Equipment.